Thank you for the invitation to participate in this discussion on the future of LGBT sports. I regret I am unable to attend in person, but I have asked our treasurer, Gene Dermody, to read this letter expressing my sentiments as Chair of Wrestlers WithOut Borders. My comments will draw on my decades as a coach and athlete and my years of involvement as a sports volunteer. We have been asked what our view is of the current international LGBT sports and cultural event schedule; any changes we would propose; what would be our ideal calendar for 2011 onward; and what role we might play in any proposed changes. Before we can discuss the current situation, we should examine what the previous situation was so we may assess what worked that still works; what has been lost; why things were lost, so that future mistakes may be averted and past mistakes corrected; and what is and was “missing” from the past or current situations that we would like for the future. So we begin with our view of the past then proceed to the remaining topics. The situation, pre-2003: For more than two decades, the calendar was shaped by and built around the quadrennial Gay Games. A plethora of local and international organizations were formed out of the unadulterated inspiration of the Gay Games, and calendars were planned to culminate every four years around the event that brought us together initially and continued to do so. Most of the inspiration from the Games was positive, such as the sportsmanship and camaraderie that led to the formation of EGLSF and the EuroGames. Even inspiration that was negative — such as the haphazard planning of the Gay Games wrestling tournaments — led to positive steps, such as the formation of Wrestlers WithOut Borders. Wrestling is a sport that reaches many living on the fringes of the sports world. It is an egalitarian catch-all serving most importantly those who are not the tallest, the quickest, the fastest, the strongest, the richest or the most athletic by providing them a sport in which they can excel and achieve their fullest potential. In this manner, it serves a unique and irreplaceable role in the LGBT sports market, engaging those otherwise unreachable. Because of the nature of our sport, WWB and its member clubs must be able to survive with extremely limited financial resources and a small membership base. The ability to come together unified every four years at the Gay Games enabled our sport not only to survive but expand. In repayment, WWB has been one of the most active member organizations in the Federation of Gay Games, attending virtually every annual meeting and providing countless hours of volunteer time to numerous FGG committee and services, as well as encouraging active participation in local city teams with our member clubs. In sum, before the creation of an alternative quadrennial event, the Gay Games were a unifying force in the LGBT sports world which inspired the creation of other organizations and events, encouraged participation in sports, empowered individuals through their participation, fueled the growth of the LGBT sports movement, and enabled us to sustain our clubs. Current situation: Following the acrimonious marketing of the 2006 Outgames and the political pressure exerted on WWB member clubs to favor the Montreal event and skip the Gay Games, at which they had always met, caused severe damage to WWB — damage we believe is illustrative of damage done across the LGBT sports spectrum and exacerbated in smaller individual sports such as wrestling. The Montreal club and every European club except London Amateur Wrestling withdrew from WWB. The turnout in wrestling for the Outgames was abysmal: 22 wrestlers, half the size of the Golden Gate tournament that year and about the size of a local club tournament in a non-Gay Games year. It was an insufficient turnout to enable safe matches for a full-scale tournament. The Gay Games wrestling tournament drew 100 wrestlers and 100 matches were contested, indicating it was an athletic success, but the experience was diminished by the dearth of diversity. The outcome of 2006 forced WWB to aggressively improve our situation. We adopted new bylaws, implemented a WWB Cup championship for non-Gay Games, and created a Hall of Merit to recognize the pioneers in our sport and document our productive symbiotic history with the Gay Games. When U.S. wrestlers were allowed in the EuroGames for the first time, several of our wrestlers participated. Last year Paris-Lutte returned to WWB, and we are hoping we are able to continue to rebuild wounded relationships as we head into the 2010 Gay Games. We also actively participated in the revamping of the FGG to an organizational structure facilitating more geographic representation and reducing the draw on resources from member organizations. This allows us to concentrate on other WWB initiatives and we are now better prepared to deal with changing circumstances. WWB agreed to sanction the wrestling tournament of the 2009 World Outgames in Copenhagen and attempted to award scholarships to get more wrestlers there. The Outgames proved a hard sell, however, and there will be only nine wrestlers at the event. This is half of what Montreal drew and less than half of what the WWB Cup championship, which uses a club tournament format, drew this year in San Francisco or last year in Chicago. WWB assessment/proposed changes/new calendar: The World Outgames are a failed experiment from a sports standpoint, an unnecessary drain on limited resources, an unwanted strain on community relations, and a destructive dilution of the Gay Sports Movement. The relationship of WWB with the FGG is better than at any previous time in our history and there is a proven track record of WWB involvement and commitment to the Gay Games. 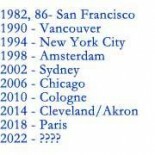 When our clubs were polled, it was agreed with no dissent that WWB is better off if the World Outgames are ended after the Copenhagen Games this year so that we may all once again gather at the Gay Games. • The EuroGames provided a lower cost opportunity for wrestlers from North America and Australasia to compete on European soil with their European colleagues. WWB would love to see the EuroGames restore their previous calendar of competition in every three years out of four: 2011-13, 2015-17, etc. • Preparations are already begun for Antwerp 2013. The community would be best served if those games were EuroGames rather than a World Outgames. • End World Outgames after World Outgames 2 in Copenhagen. • Encourage GLISA to continue to explore the possibilities of Continental Outgames in Australasia, South America, eastern Europe and Africa. The Continental Outgames format of conferences, celebration and sports and cultural activities is an optimal stage for expansion of LGBT sports activism in repressed and geographically under-served areas. • Encourage development of more single-sport global championships in non Gay Games years such as IGLA and IGLFA have long had and which WWB initiated in 2008. • Encourage more single-sport clubs to establish annual championships either on their own, such as New York Metro Wrestling Alliance or San Diego Bulldogs Wrestling have, or as part of a local city team sports festival, such as Paris-Lutte has with FSGL and Philadelphia Spartans have had with Team Philadelphia. • Greater focus on sports in Gay Games, reflected expressed desires from post-Sydney polling. What role will WWB play? WWB sanctioned the 2009 World Outgames but does not have the resources to provide extensive support for two global quadrennial multi-sport events. WWB will continue its WWB Cup in non Gay Games years, will continue to encourage wrestling clubs to be members of their local city teams and participate in sports festivals, and will continue to support the Federation of Gay Games and the Gay Games event itself. We cannot sanction a World Outgames tournament past 2009. We will also continue to encourage organizations to join such groups as EGLSF and the FGG — and not just join, but be active participants in their internal dialogues. I thank you again for your invitation to join in this conference and your indulgence in the reading of our position. This is an issue we feel passionately about and we have thrown ourselves sincerely into making the current calendar work with every resource we have. It is our assessment that as a community we will all be better off with the Gay Games as the one global multi-sport and cultural festival so that we may all concentrate on the work of helping reach out to empower more people through the song of sport.